Over the past 20 years approximately 35 cropmarked defended enclosures have been discovered in the rich farmland of southern Ceredigion through aerial photography. Many of these newly located sites are rectangular in shape, prompting questions about their origins and function. All of these sites lie on heavily cultivated land raising concerns about plough damage to an uncharacterised archaeological site type. The aims of the project are to assess the archaeological significance of these sites, to evaluate their vulnerability and formulate scheduling/management strategies, and enhance HER. Gradiometry survey of Blaensaith enclosure. The silted defensive ditch and the plough-out bank are clearly visible as are two roundhouses. The southern house has a west-facing entrance and the northern house appears to be of at least two phases. Other internal features are present, including other possible roundhouses. During the summer of 2004, the Trust, in partnership with the Department of Archaeology of the University of York, conducted magnetometry and topographic survey on eight rectangular enclosures. This work confirmed that only rarely did any surface evidence for the rectangular enclosures exist, and where present it was very slight. However, magnetometry demonstrated that important below ground archaeology is likely to survive in addition to the crop-marked ditches recorded on aerial photographs. In particular circular gullies, probably indicating the location of roundhouses, hearths, post-holes and internal divisions of the enclosures were detected. This evidence is similar to that obtained by excavation on Iron Age defended settlement sites. 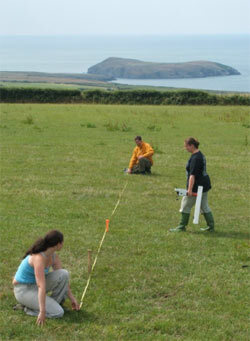 Early in 2005 resistivity survey was carried out on three of the sites surveyed during the previous summer. Despite good weather/ground condition for resistivity survey, the results were poor, indicating that this is not an appropriate technique on this type of site. Penbwliad magnetomety showing the enclosure ditch, traces of a bank, internal division and possible roundhouses. During the summer of 2005, five further cropmarked enclosures were surveyed and one was partially excavated (Troedyrhiw). This year it was decided to survey other enclosure shapes, not just rectangular. Three of the geophysical surveys produced good results (revealing evidence not apparent on aerial photographs), one survey produced no additional evidence, and results from the final site were poor. The best results were from Ffynnonwen, where roundhouses were detected within a circular inner enclosure and other features in a large elliptical outer enclosure. The excavation at Troedyrhiw produced excellent results. Work concentrated on the enclosure’s entrance and a small portion of the interior just within the entrance. Hard shale bedrock lay immediately below thin topsoil. No floor deposits, yard layers, road surfaces or similar layers survived, but a variety of pits, post-holes and gullies were excavated. No structures were identified, but survival on the site strongly suggests that building remains will survive elsewhere within the enclosure. The ditches flanking the entrance were almost 3m deep with a V-shaped profile. Their upper fills contained quantities of pottery. Over 200 sherds of pottery were found on the site. Most is Roman in date and style, but a few sherds seem to be ‘native ware’, possible late Iron Age, but more likely to be Romano-British. A coin, possibly Vespasian, was found in the upper levels of one of the ditches. Samples for palaeoenvironmental analysis were taken from most contexts. A brief report on the excavation will be produced this year, with the post-excavation analysis held over to next year. During the summer of 2006, in partnership with the Department of Archaeology University of York, six cropmarked enclosures were surveyed and one of the enclosures surveyed in 2005 was partially excavated. 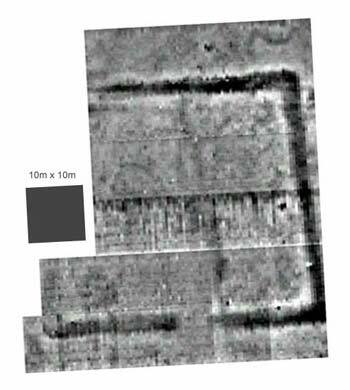 Geophysical survey at Berry Farm detected the defensive ditch of this promontory fort and large internal divisions, but little in the way of internal detail. At Penpedwast, ditches of a rectangular enclosure, an entrance and a central roundhouse were discovered. Results at Tre-cefn Isaf were equally good, with the ditch of a sub-circular enclosure, an entrance, a roundhouse and other internal features visible on the geophysical plot. Cwm-howni was a sub-circular enclosure with internal and external ditches, and large anomalies within the enclosure. Part of Troedyrhiw enclosure was surveyed in 2004, and excavated in 2005. In 2006, the survey of the enclosure was completed revealing the remainder of this rectangular enclosure and a possible external ditched track. Finally, the whole of the site at Ffynnonwen, partially survey in 2005 and excavated in 2006, was surveyed with excellent results. The Ffynnonwen geophysical survey indicated an entrance on the north side (as did the aerial photographs) and at least four internal roundhouses. The strategy in 2005 at Troedyrhiw had been to excavate the entrance ditch terminals and a portion of the interior. This had proved successful at Troedyrhiw as most of the artefacts were found in the upper ditch fills. Numerous pits and post-holes were also discovered within the interior. The same approach was employed at Ffynnonwen and topsoil was machine stripped from over the ditch at the supposed entrance and from part of the interior, sufficient to reveal at least one complete roundhouse. It was immediately clear that the entrance was not where the aerial photographs and geophysical survey had indicated. There was a ditch, but the builders had only been able to penetrate 10cm-20cm into the very hard bedrock that characterised this part of the site. However, a section cut through the ditch on the west side of the enclosure where bedrock was more shattered revealed a steep, V-shaped ditch 4m wide and 2.2m deep. Two of the very few finds came from the upper fill of this ditch: a piece of slag and a spindle whorl made from a reused sherd of Roman Severn Valley Ware pottery. The large oval enclosure ditch was found to be less substantial, 4m wide and 1m deep, with an open V-shaped profile. Within the interior a suite of buildings and structures was discovered characteristic of a late Iron Age settlement. A completely excavated roundhouse was defined by a wide drainage gully encircling an insubstantial wall line of a house 8.3m diameter. Evidence from the post-holes of the east-facing entrance indicates at least three rebuilds. The drainage gully and wall-line of part of a second roundhouse 6.2m diameter lay on the southeast side of the excavation. Arcs of three gullies, indicating at least three phases of a third roundhouse of perhaps 10m diameter lay on the south side of the excavation. A four-post structure lay in the open area between the houses, and a six-post structure pre- or post-dated the completely excavated roundhouse. The overall impression is of an intensively used internal space, occupied, perhaps, over several generations. 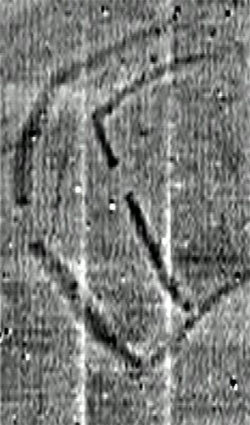 Evidence for occupation of the site prior to the construction of the circular enclosure, was revealed by both the excavation and by a geophysical survey of the complete site completed in 2006. A curving palisade trench predated the enclosure ditch and the completely excavated roundhouse. The geophysical survey suggested that this feature formed a circular enclosure. A fragment of a glass bead was found in the trench. This palisaded enclosure lay close to the centre of the large oval enclosure and had a centrally located roundhouse. 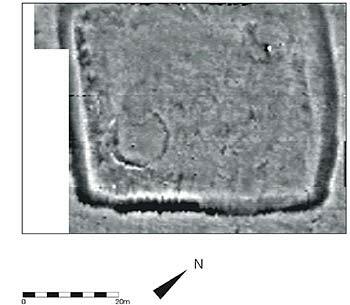 The 2006 survey also detected a small rectangular enclosure, with roundhouse, attached to the south side of the oval outer enclosure. Palaeoenvironmental samples have been sent to A Caseldine, University of Wales Lampeter for initial analysis. Ffynnonwen geophysics. The combined 2005 and 2006 Ffynnonwen geophysical survey. The survey squares are 20m square. Ffynnonwen showing the excavation of two of the roundhouses. During the summer of 2007 geophysical survey took place at five sites. Identifying defended enclosures for survey was more problematic in 2007 than in previous years owing to several factors. First, many sites have now been surveyed. Second, the unusually wet summer meant that many farmers had not cut their silage and, third, there is an increasing amount of cereals being grown in west Wales. This resulted in the first two sites surveyed lying in west Carmarthenshire. At Llangan Church two separate surveys were undertaken, the first to the north of the church in the field in which St Cana’s early medieval inscribed stone formerly lay, and the second to the south, the site of a complex circular crop-marked enclosure. Both surveys revealed extensive below-ground archaeology. Survey at Plas-y-Parc revealed a concentric crop-marked enclosure, as did the survey at Treferedd Uchaf - the latter site also having possible internal structures. Part of a complex enclosure was revealed at Ffynnon Llygoden, as well as part of a small rectangular enclosure, which may be an early medieval cemetery or a temple. Survey at this site was halted by foot and mouth restrictions. The final survey was therefore on non-agricultural land at Nevern Castle. The results here were disappointing. A promontory fort at Berry Hill, Newport was selected for excavation. The area around the entrance was stripped of topsoil, exposing the main ditch terminals, the area of the presumed gateway, parts of the defensive banks and part of the internal fort area immediately within the entrance. The north ditch terminal was rock cut and V-shaped, approximately 2m deep. The south terminal was deeper. However, it was unfinished and after plunging down to almost 3m deep at the terminal rapidly shallowed out. The bottom few centimetres of the bank on the north side of the entrance survived; that to the south side had gone. The gateway was a simple, single-phase structure, consisting of a pair of main post-holes with a pair of smaller post-holes set back towards the interior. One of the main post-holes cut through a substantial palisade trench - this was the only evidence for more than one phase of use. No diagnostic artefacts were found, but numerous perforated shale disks of various sizes were discovered in the ditch fills. The nature of the defensive ditch, the paucity of artefacts (in particular the lack of Roman Period finds), the absence of houses and other structures and simple single-phase entrance all suggest an unfinished and lightly used fort. Post excavation analysis may help clarify this issue. During 2008-09 an article for publication detailing the results of this project will be produced.